Contact Early Childhood Education at ECadvise@gmu.edu. An ECE Advisor will answer any questions that you may have about your program or degree. The Early Childhood curriculum boasts of many innovative and cutting edge Early Childhood Education courses. See course options below. Praxis Core and Praxis II Preparation Workshops offered on campus. Virginia Test Requirements - Includes breakdown of each test, online study materials, registration, etc. All CEHD undergraduate and graduate students are held to the university grading policies as described in the Academic Policies section of the catalog. Those students enrolled in a CEHD licensure program, however, must earn a B- or better in all licensure coursework. A degree-seeking graduate student will be dismissed after accumulating grades of F in two courses or 9 credits of unsatisfactory grades (C or F) in graduate courses. A 3.0 grade point average is required for completion of the graduate degree. 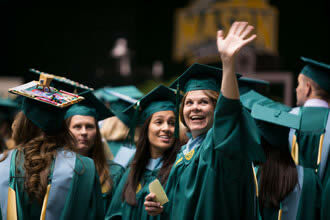 Rates are available at http://studentaccounts.gmu.edu/tuition.html.